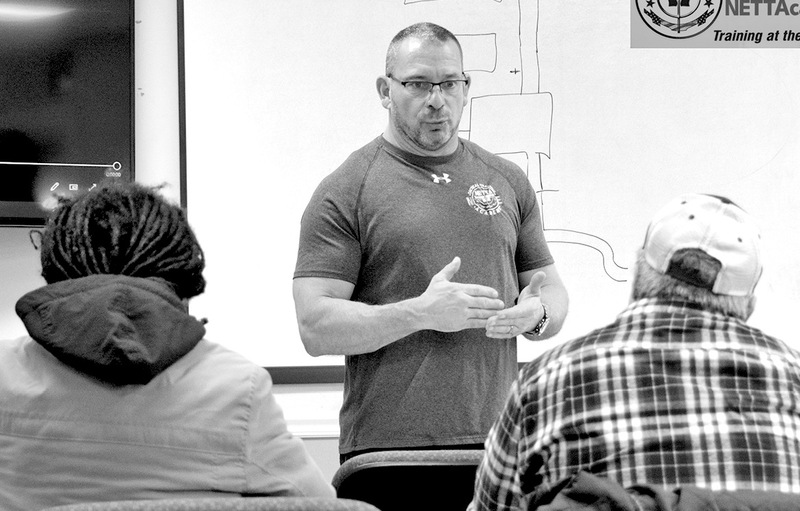 John Viscomi is pictured during one of the gun safety training lectures he offers at the Suffield Ambulance Center or Fire Station No. 2. NE Tactical Training Academy opened doors in Suffield at 801 Thompsonville Road on October 1. Founder John Viscomi brings over six years of experience training law enforcement on tactics and techniques to his new business. Professionally trained instructors lead class sizes of 5–7 in Suffield, ensuring that both basic and advanced participants receive the individual attention needed to leave their training with the confidence to defend themselves. Among the training delivered is a Conn./Mass. Dept. of Public Safety approved Pistol Permit Class, which ends with the documentation needed to submit the application. John’s multi-media class surpasses the general NRA nationwide online course by including state-specific laws and providing supervised hands-on instruction including loading, sighting, resolving equipment malfunctions, and shooting. Family members are encouraged to sit in to increase their understanding and take the mystery out of firearms. Training is a critical first step in responsible firearm ownership and safety. Keeping skills and knowledge fresh and current is also important. NE Tactical Training Academy addresses that need by offering refresher training for the cost of the ammunition. Additionally, NE Tactical Training Academy handles firearm sales, transfers, and purchases. Their experienced staff understands the importance of matching an individual with a firearm and consults to identify the best fit to ensure the highest level of safety and comfort for the customer. John has an open door policy and welcomes questions. For more information, send an email to info@NETTAcademy.com, call 860-803-5596, or visit their website at https://www.nettacademy.com.